Has your child decided to learn a new language this summer? Maybe your whole family has decided to learn Spanish! 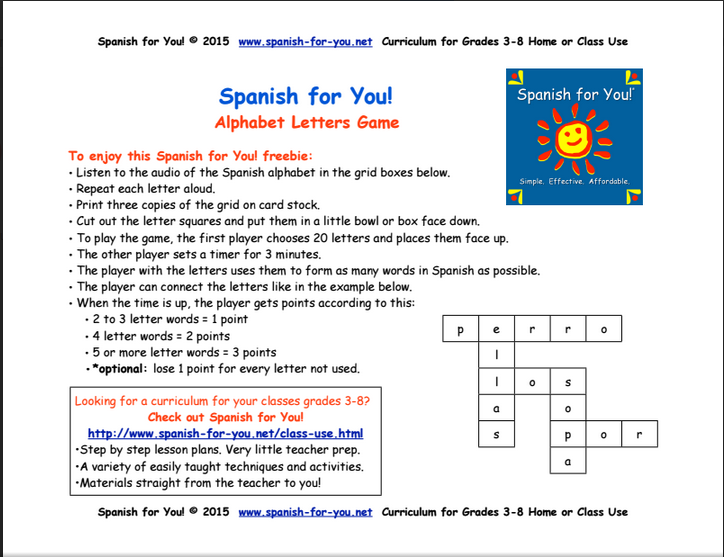 If so, you're going to really enjoy this month's Spanish-learning freebie from our sponsor Spanish for You! If you're looking for a way to boost your Spanish spelling skills or even just simply test your knowledge of Spanish vocabulary, this is a great game for you! This Alphabet Letters Game comes with letter cards and directions for playing. (It's sort of like scrabble, but not different.) It also includes an audio file to help the players/learners with the pronunciation of the letters in Spanish.